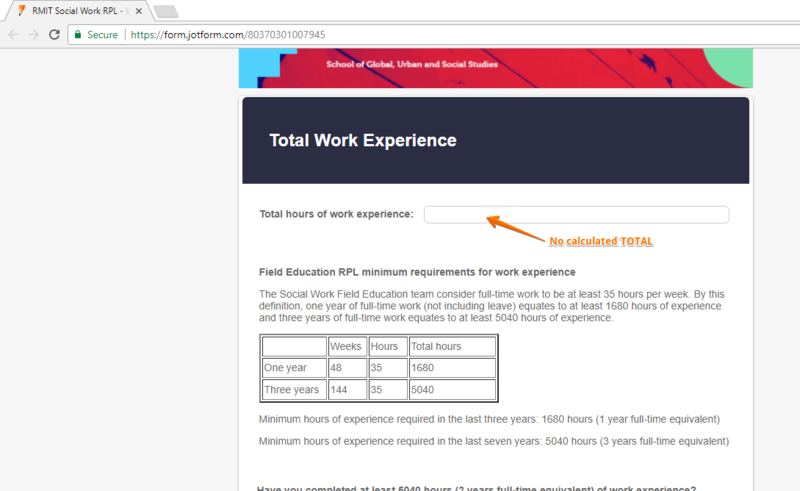 I have built a form in which people can calculate how many hours of work experience they have had at different workplaces. 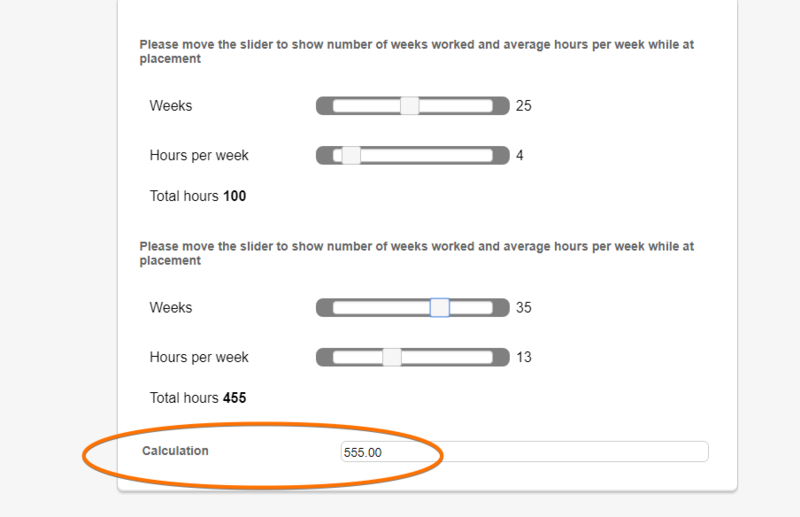 Individuals can use the slider with calculated result to determine how many hours of work experience through weeks worked and hours per week at up to 6 workplaces. I was able to then add all the hours from the 6 workplaces together using form calculator to have the total hours of work experience. However, the form calculator no longer works. I have tried redoing it - in multiple ways - and it no longer will add all the work experience hours from the slider together. I've attached a screenshot of the form calulator to show you how it looks when all the sliders results are calculated. Can you please let me know how I can make the form calculator add all the slider results together? As you can see, fields are showing as strings (that's why they are light brown). And that is not the name of the field, that is ID of each field. But I had a hard time testing this sine the wizard for the slider is not loading so I will forward that to our backend team for further checking. We will get back to you through this thread. This was the latest attempt to try something that worked. I have the same result when I selected each field I wanted to add together. Has there been any progress with this? I need a resolution as soon as possible. We apologize for the delays. I made a test form using a copy of your form and I was able to see the issue as well. The Form Calculation widget is not calculating the total result using the Sliders with calculated results widget. I will do further test. I'll be back shortly. It looks like the Form Calculation widget on the form was corrupted and is no longer working properly. I was able to find a fix by replacing it with a new one. After using a fresh calculation widget, the calculation function is now working. Please try the steps I did also on your form. Remove the Calculation form and add a new one. I tried that prior to contacting you and now again and it still hasn't worked. It seems from your screenshot that the questions and calculator are all on the same page. The form I have set up is on multiple pages. Could this be affecting it? I tried again, in multiple browsers and I asked my colleague to try as well and we both had the same result. When I had a look at the GIF above, it seemed you were only calculating hours on one of the sliders. The issue is combining the result of 4 to 6 of the totals of the calculating sliders. I get a huge number as soon as I start combining the results. Are you able to make it work when combining multiple calculating sliders results? You're absolutely correct, I'm sorry. I was able to replicate this issue completely. It is related to the fact that page breaks are used. I will forward this issue to our backend team for further checking. We will inform you through this thread about the outcome. Is there any update on the page breaks? We apologize for the delays. Unfortunately no updated status yet from our developer assigned to the submitted ticket. I will do a follow up about it on your behalf as well. You will be notified here once we news/updates on the status. 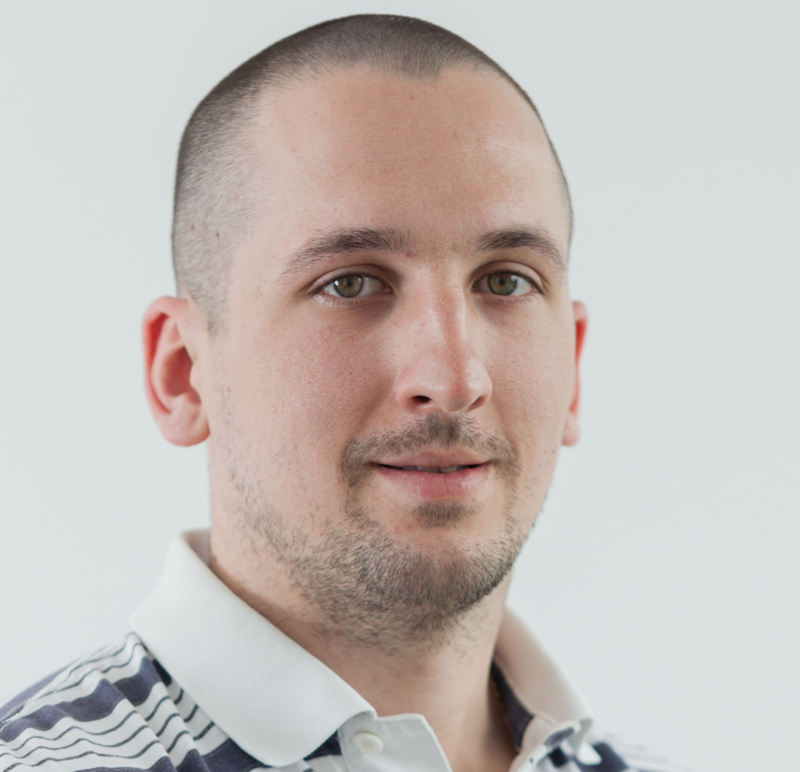 I'm afraid that the issue is still being worked on by our colleagues from backend team. We will inform you as soon as there are any updates.